"Marooned," 1909. Howard Pyle (1853-1911). Oil on canvas, 40 x 60 inches. Delaware Art Museum, Museum Purchase, 1912. "The Buccaneer Was a Picturesque Fellow," 1905. Howard Pyle (1853-1911). Oil on canvas, 30 1/2 x 19 1/2 inches. Delaware Art Museum, Museum Purchase, 1912. "The Mermaid," 1910. Howard Pyle (1853-1911). Oil on canvas, 57 7/8 x 40 1/8 inches. Gift of the children of Howard Pyle in memory of their mother, Anne Poole Pyle, 1940. Howard Pyle (1853 – 1911) was one of America’s most popular illustrators and storytellers during a period of explosive growth in the publishing industry. A celebrity in his lifetime, Pyle’s widely circulated images of pirates, knights, and historical figures were featured in publications such as Harper’s Monthly and were admired by artists and authors like Vincent Van Gogh and Mark Twain. Yet, despite his widespread popularity, Pyle’s reputation has survived only among illustration scholars and enthusiasts. Until now his work has been virtually omitted from the larger story of art. 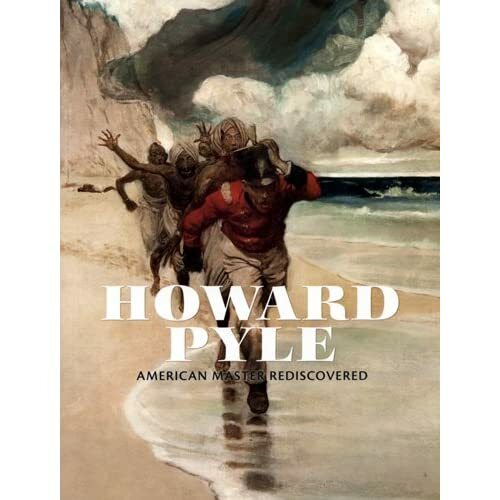 In celebration of the centenary of Pyle’s death, the Delaware Art Museum presented Howard Pyle: American Master Rediscovered, a major retrospective exhibition featuring 79 paintings and drawings created by Pyle between 1876 and 1910, on view November 12, 2011 – March 4, 2012. This exhibition presents a fresh perspective on Pyle’s familiar images, exploring his interaction with the art and culture of his time and effectively repositioning him within the broader spectrum of 19th-century art. This retrospective exhibition also marked the 100th anniversary of the Delaware Art Museum, which was founded in 1912 to preserve and exhibit Pyle’s work following his untimely death in November 1911. The Museum’s Centennial Celebration began in November 2011 with the opening of Howard Pyle: American Master Rediscovered and ends in June 2013 with the exhibition Contemporary Illustrators Honor Howard Pyle. Visions of the Past concentrated on Pyle’s depictions of history, including Roman gladiators and Medieval knights. His views of the classical world drew inspiration from the work of the French academic artist Jean-Leon Gérôme (1824 – 1904) and his numerous depictions of the Middle Ages show how conversant Pyle was with the works of the 19th-century Pre-Raphaelites. Pyle’s pirate imagery is based on his own personal archive of costume books and historic manuscripts; however, his use of strong diagonals, flat compositional arrangements, and restrained placement of color suggests an understanding of the art world’s new-found interest in Japanese ukiyo-e prints. The contemporary art world was obsessed with Japanese art as reflected in the work of James McNeill Whistler, James Tissot, and Edgar Degas, among others. Fairytale and Fantasy focused on Pyle’s fairy tales and children’s illustrations, which show his knowledge of European illustrators, including Walter Crane (1845 – 1915) and Kate Greenaway (1846 – 1901). His depictions of the world of make-believe also reflect many of the themes and methods of European Aesthetic and Symbolist art. America – Past and Present highlighted Pyle’s enthusiasm for the American Colonial Revival of the 1880s, which celebrated the history of the United States. Many of Pyle’s iconic Revolutionary War scenes seem to have been strengthened by knowledge of the work of the French Salon artist, Jean-Louis-Ernest Meissonier (1814 – 1891), whose military scenes of the Napoleonic Wars were immensely popular.